Premium1999 Kwik Kamp by USA Venturecraft – a larger version of the motorcycle Kwik Kamp – ultra light weight tent trailer, pop-up camper, in great condition: no tears in vinylized roof, zippers or window netting. Easily pulled by our 2003 Honda CRV to places like the Grand Canyon and San Juan mountains of Colorado. Getting off the ground with mattresses makes this a great upgrade from tent camping. The box dimensions are 4’ wide and 6’ 8” long. The overall length is 10 feet from the 1 7/8” ball hitch to the stern. Two plywood wings open and the tent unfolds easily to create a roomy tent trailer with two beds; a full and a twin bed. We’ve used mattress protectors, so the mattresses are clean. A pedestal table installs easily between them. A large storage box sits over the hitch, and holds wing supports, wheel chocks and room for tarps and tools. I added several improvements including new tail-lights and a swivel trailer jack that makes it easy to move the 500 lb. trailer and box into position. Tires are 5.70 x 8 Carlises. There is a spare under the hitch. 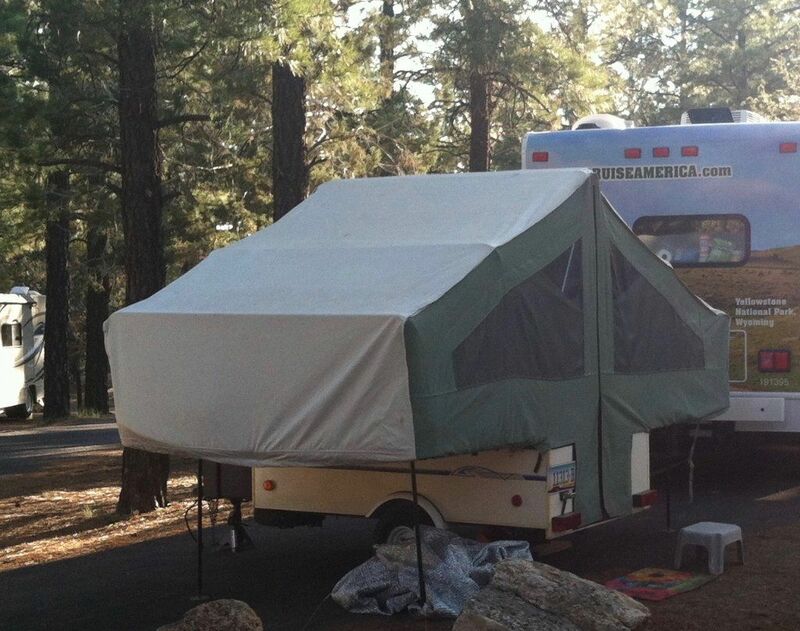 A rubberized vinyl skirt protects the top of the closed camper while traveling. Kwik Kamp campers, especially this full sized one, are very rare, and at the asking price of $1500 represents a true value when compared to expensive, and heavier, pop-up campers. Serious inquiries only.